Personally I think Upper Deck has been good and bad for the hockey fan or the hockey card collector. As with most hobbies these days, collecting sports card has become a business. The price of collecting cards has made it challenging for some fans to continue with. Don;t you remember as a kid, getting your allowance money and going to the corner store to buy a couple of packs of hockey cards? It wasn’t that long ago that a pack of hockey cards was like $0.50 or even a $1.00. You’d get a stick of bubble gum and like 8-10 cards of your favorite players in a pack. Fast forward to today where a pack of hockey cards ranges from $3 to $9 per pack and collecting has become a bit steep for your average kid. A blaster box of hockey cards might typically include 8-12 packs with 5-8 cards per pack. An average set might range from 300-600 cards. You can do the math and see just how much it would cost to get a complete set each season. 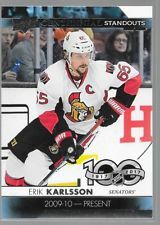 However, you have to give credit to Upper Deck the quality of the cards has never been better and in the centennial year of the National Hockey League, Upper Deck has launched a couple of special, commemorative sets include the Centennial Standout collection found in various packs of their 2017-2018 Upper deck hockey card packs. What we like about the set is the diversity of the players and some of the classic images of the players. While younger kids may not have seen Bobby Orr, Paul Coffey or Jean Beliveau play, the Centennial Standouts cards capture some of the classic moments from the NHL’s past and present stars. This is not based on value or difficulty in acquiring, this is simply our own personal preference based on the look and history of the player. 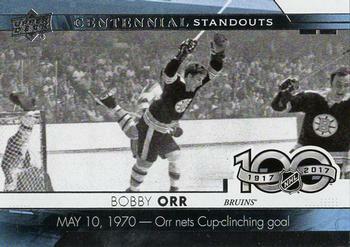 Bobby Orr (CS-48) – one of the most iconic images in hockey history. Wayne Gretzky (CS-99) – classic Gretzky in the Edmonton Oilers uniform. Bill Barilko (CS-51) – made famous in a Tragically Hip song, Upper Deck did a nice job including this famous image of Barilko from the Toronto Maple Leafs. It happens to be the Leafs Centennial as well so Leafs fans will find a number of their favorites in this set. 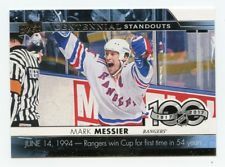 Mark Messier (CS 94) – I used to love it when New York Islanders fans used to chant “1940” at Ranger games. At that time the Rangers had not won a Stanley Cup since 1940 while the Islanders had captured 4 straight in the early 80’s. Mark Messier should have won the Conn Smythe in 1994 as he shoulder the blueshirts to their first Cup win since 1940. Awesome card! Jean Beliveau (CS 64) – its cool to see some of the games greatest players with the Stanley Cup. Habs fans will like this great card with Jean Beliveau hanging with one of the many Cups that he won as part of the Montreal Canadiens organization. 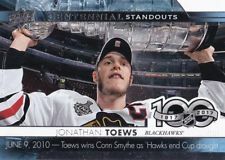 Johnathan Toews (CS 49) – just another cool pose with the cup on this one. Captain Serious is almost cracking a smile as he hoists the Stanley Cup for the Chicago Blackhawks, the NHL’s modern day Dynasty. 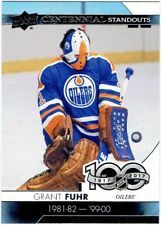 Grant Fuhr (CS 13) – this is just a classic pose that was captured with Grant Fuhr in his excellent Edmonton Oilers old school goalie mask. 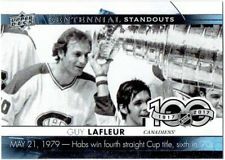 Guy LaFleur (CS 79) – another great Stanley Cup related image of yet another Montreal Canadian with hockey’s Holy Grail. The LaFleur short print card is also a nice one as well. 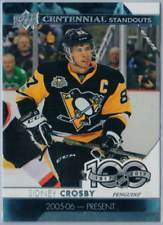 Sidney Crosby (CS 87) – the short print Crosby card of Sidney Crosby just seems to illustrate his compete level doesn’t it? It’s own of our favorites from the set.